Shouldn’t it be a trade violation to threaten to move someone’s job to another country? Shouldn’t we negotiate trade agreements that increase people’s wages on both sides of a trade border? These are the kinds of agreements we would make if We the People were negotiating trade agreements with representatives of the working people in other countries. Unfortunately that is not the kind of trade agreements that our current trade negotiation process produces. The secret Trans-Pacific Partnership (TPP) negotiations resumed this week, this time in Washington. 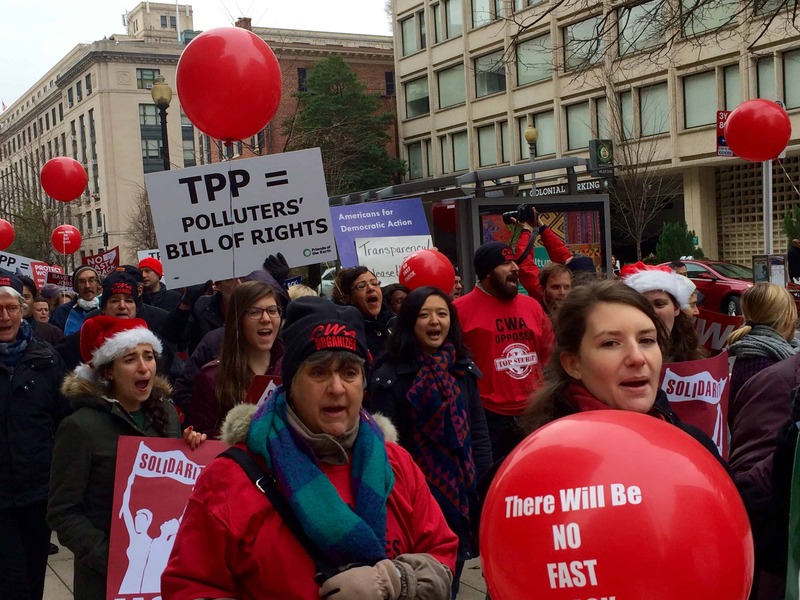 TPP is a massive agreement that sets up new rules for over 40 percent of the global economy. It will have profound effects on our jobs, our standard of living now and in the future and our ability to make a living as a country. Oddly, though, as of Monday morning you have to read about it in Japan Times because few-to-no U.S. media outlets are covering it. 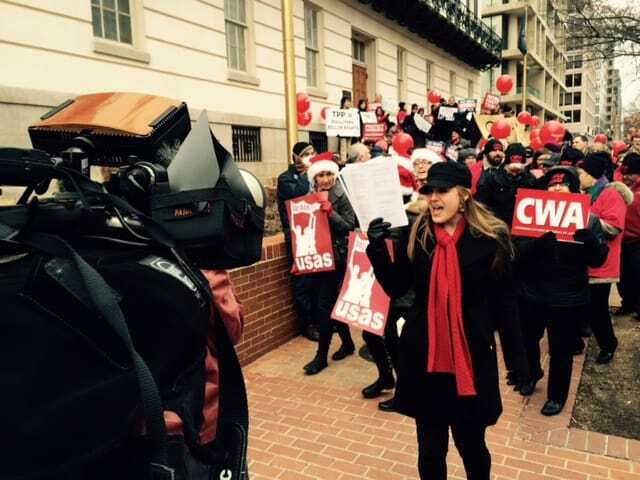 In spite of the lack of American media coverage of this tremendously important agreement, representatives of labor, environmental, family farm, consumer, Internet freedom, public health, faith, human rights and community organizations held a rally Monday outside the office of the U.S. Trade Representative. These organizations represent “stakeholders” from all countries that are denied a seat at the TPP negotiating table. Chief negotiators from 12 countries involved in the Trans-Pacific Partnership initiative resumed negotiations in Washington after their leaders reaffirmed last month they will conclude an agreement as soon as possible. 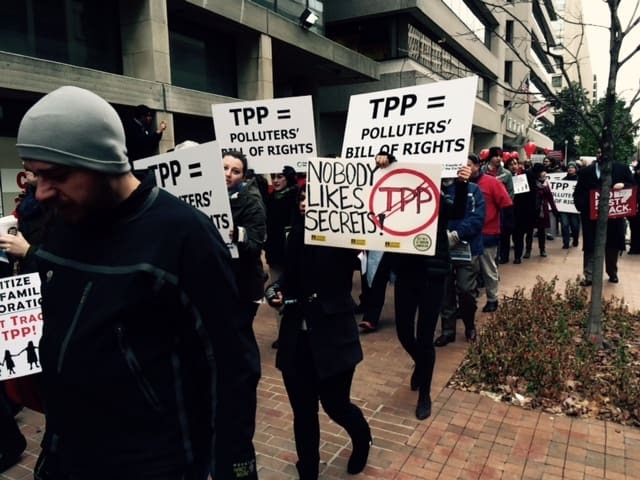 Wednesday at 11 a.m. the AFL-CIO is holding a TPP briefing on “What Negotiators Should Be Discussing Behind Closed Doors,” at their Washington headquarters at 815 16th St, NW. While we do not know exactly what is being negotiated, we do know from leaks – and previous “NAFTA-style” trade agreements – tell us what to expect. Much of TPP is about “investor protections” and not trade at all. These provisions allow corporations to sue governments for doing things that infringe on profits – like laws and regulations protecting the environment, worker safety, consumers and the health of citizens. For example, under similar agreements already in effect tobacco companies are suing governments to block anti-smoking efforts that protect the health of citizens! Members of Congress are very concerned about the transparency of the TPP negotiating process. On a call Monday, Reps. Rosa DeLauro (D-Conn.), Louise Slaughter (D-N.Y.), Tim Ryan (D-Ohio), Keith Ellison (D-Minn.) and (rock star) Dan Kildee (D-Mich.) expressed their concerns about the secrecy of TPP as well as the failure to address currency manipulation in the agreement. Congress is very concerned about this. Last year 60 senators, a bipartisan majority, sent a letter to President Obama asking him to tell TPP negotiators to address currency manipulation. Also last year, a bipartisan majority (230) of members of the U.S. House sent a letter to President Obama saying they want him to tell TPP negotiators to address currency manipulation. Sixty senators and 230 members of the House want the negotiators to address currency manipulation – but TPP still does not address currency manipulation. What else do you need to know about the negotiating process, and respect for democracy and national sovereignty? Sum of Us: Sign the petition to governments worldwide.